Should you restore or replace your historic windows? Original wood windows are a valuable architectural detail of your home, and should be preserved in order to maintain its architectural integrity. The placement, size, materials, and profile of your windows were designed by the architect or builder as a contributing element to the total design of your home. Windows are as important to defining the style of your home as are the other architectural elements, such as the roofline and footprint. In addition to being an integral design element of the architecture of the structure, original wood windows made prior to 1940 are constructed from the heartwood of original growth lumber. The extracts that collect in the heartwood make it richer in appearance, more decay resistant, and more stable. This valuable wood is no longer available today. Another treasure inherent in old windows is the wavy glass that beautifully reflects light. Original windows have true divided lights, where each pane is a separate piece of glass that was set in hand-crafted wood frames. These elements give depth and dimension to your windows. It is important to preserve your windows because not only are you throwing away valuable resources by replacing them, but the type of old-world craftsmanship that went into the details of the window and hardware is lost as well. Unfortunately, due to the marketing and growth of the window replacement industry, original windows are disappearing from older and historic buildings at an alarming rate, where they add to the dilemma of our overflowing landfills. It is estimated that 30 million windows will be replaced in homes in 2015. 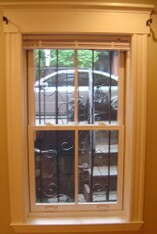 The driving forces behind decisions to use replacement windows are energy cost savings and maintenance concerns. However, with the cost of replacements running between $450 and $1400 per window, they frequently are selected based on the lowest cost. Two in every three new windows are vinyl, which do not replicate the original windows in materials, profiles, design, etc. Vinyl has become an environmental concern in both its manufacture and its eventual disposal. What many homeowners don’t know is that based on energy savings alone, it would take 75 years to recoup the expense of replacement windows. A 1996 Vermont study* reported that, based on energy savings from replacement windows vs. original windows, replacing a window solely due to energy considerations is not worth the cost. Replacement windows will never generate energy savings to offset the cost of replacing them at the end of their life span. Also, historic windows can be retained and upgraded to approach the thermal efficiency of replacement windows. By adding storm windows to single-pane glass, historic windows approximate the energy ratings of double-glazed replacement windows. Exterior storm windows have an added advantage in that they protect the exterior of the window, lowering maintenance costs, and extending the life of the window. While replacement windows appear to be maintenance free, you cannot maintain or repair them. The best replacement window companies guarantee the glazing units for 30 years, 20 years for the sash. The biggest problem is the short expected life of the glazing. Sometimes after only a few years, the seals break causing the double-glazed windows to fog. Your only solution then is to replace the replacement windows. In addition to the glazing problem with replacements, you have the issue of visual impact. Especially with vinyl replacement windows, the frame will yellow over time from the sun. Even wood replacements aren’t as durable as original windows due to the fact that they are from second growth lumber, which is more vulnerable to decay and less stable. Once you begin the “rip out and replace cycle,” it will continue for the life of your home. Our landfills will be burdened with a never-ending supply of failed windows. Maintenance of original wood windows, even if professionally repaired and serviced, is not as costly as replacing your windows every 10–25 years. But repairing, restoring and maintaining wood windows is easy to do yourself when you break down the task into small steps. 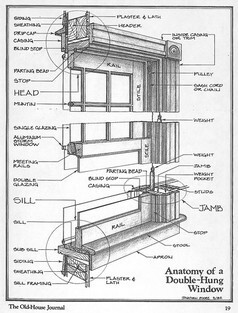 An excellent resource on the maintenance and repair of historic wooden windows is Preservation Brief #9 at www.cr.nps.gov In this article, the job is broken down into small easy to follow steps that the do-it-yourselfer can easily follow. 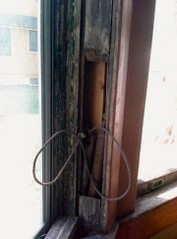 Repairing and maintaining wood windows is less expensive than replacing them. So, if your windows need attention, do not replace them. Preserving original wood windows is better for the environment, saves energy, and maintains the architectural integrity of your home. *Testing the Energy Performance of Wood Windows in Cold Climates, August 30, 1996. A Report to the State of Vermont Division for Historic Preservation, Agency of Commerce and Community Development.